Can photography improve your mental health? Can photography help people with mental health issues, including stress, depression and anxiety? Landscape photographer Paul Sanders believes so. A former Reuters photographer and picture editor for The Times, now an acclaimed fine art landscape photographer, Paul leads photographic tours and iPhoneography courses, as well as one-to-one workshops for people with mental health issues. A mindful approach, he suggests, can help others, just as it helped him work through his own feelings of stress and depression. It may well improve your photography along the way, too. Here, he talks to Graeme Green about mindfulness, photo expeditions in Kyrgyzstan, and the benefits of spending time in the great outdoors. How does mindfulness relate to landscape photography? PS: In a way, mindfulness really is all about landscape photography, or landscape photography is all about mindfulness. To get good landscape pictures, you have to be totally present in the moment and in the location that you’re working in. By default, you’re being mindful, even if you’re not aware of it. The key to it is that you have to recognise that you need to be mindful to take great pictures. You need to give yourself permission to stop and step away from the demands of normal life. What does a mindful approach to landscape photography look like? A mindful approach to landscape photography involves a lot more in the way of feeling the location. It’s about allowing every single sense that you have to be there and to be present. It’s not about the camera. It’s not about any kit you use. It’s not even, to start with, about the composition. It’s allowing yourself to just sit or stand in a location, to feel the wind, to smell the grass or the leaves or the ocean, to feel the texture of the soil. Mindfulness is actually just shooting your photos purely for you. It’s about all of those things that heighten your awareness, and by heightening your awareness, you start to see into the landscape in a way that makes it more than just a pretty picture. Do you think the approach improves your photography? Yes, it does for mine. It gives you a different take. As photographers, most of us worry about the results. We want people to like our work and tell us how wonderful it is. Mindfulness is actually just shooting your photos purely for you. It’s about not worrying about whether people will like it, whether they won’t like it, even if the image works. It’s about the process. You really go through the process of creating the photo. Some of your recent Instagram posts talk about simplicity. 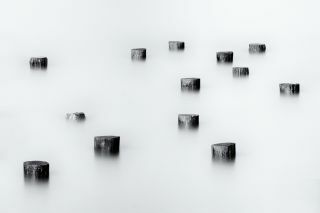 Is simplifying things, whether that's photography or elements of daily life, also connected to the idea of mindfulness? Oh yes, hugely. I worked before as a newspaper’s picture editor. I used to chase success and material wealth, and when I achieved it I realised how poor my life was. I lost my marriage and some friends over the way I was. It was only after I had a nervous breakdown caused by stress that I realised what was truly important in life. So I changed everything in my life and simplified my lifestyle as much as I could. Did it work, or do the realities of working as a photographer make that difficult? Personally, I’m always overloaded with deadlines, emails and other work. It does work, although it’s hard to always get the balance right, especially as a self-employed photographer. I try to maintain an awareness of my schedule. But sometimes, it does run away with you and that’s when I turn to mindfulness, getting out with my camera, going out and just giving myself some breathing space. I don’t answer emails until I am ready. Texts are the same. I pay little attention to Facebook and I don’t answer my phone. I’ve tried to take control of some of the things that could lead to stress. I don’t answer emails until I am ready. Texts are the same. I pay little attention to Facebook and I don’t answer my phone. Is that appreciation of simplicity also expressed in your photography? Yes. Minimal images work for me at the minute. They reflect the simplicity I want to achieve in my life, especially the long-exposure images: simplicity and calm. You believe landscape photography can be good for mental health and help people with mental health issues. What kind of mental health issues can photography help with? I think photography can help anxiety, depression and a sense of self. The whole process is calming and I found that particularly helpful, plus the use of imagery created by me helped me talk through the issues that I had with my therapist. You run workshops for people with mental health issues, don’t you? Yes, I do. They’re usually one-to-ones to help people find their voice visually. In what ways can photography help people? Photography in general is good for mental health, in the same way that many creative arts can be. I found photography really helped me develop my sense of self and gave me a way of expressing myself when I found traditional counselling difficult. You also lead photographic tours with Light & Land to some pretty adventurous destinations: Albania, Romania, Macedonia ... Do you have an adventurous side? Yes. That comes from my journalistic past. I love exploring new places. It's literally getting out of your comfort zone, and that works on every level. You have to push yourself a little to get the best out of yourself. You were recently in Kyrgyzstan, a country many people seem curious about. What’s it like? Does it have a lot of photographic potential? Kyrgyzstan is incredible. I could have taken pictures on every street corner. It is truly beautiful and unspoiled in so many ways. You have to push yourself a little to get the best out of yourself. The photographic opportunities are huge, whether it’s the mountains, the plains, the people or local crafts. Even the bus stops are beautiful. I can’t wait to go back there and show people what’s there. As well as natural landscapes, you work a lot in global cities. Do you have a favourite city to photograph? I love New York City. I always have. It makes the hairs on my arms stand up. It’s got everything from canyons of tower blocks to lively people who are rushing everywhere. I also love Paris. Paris, on the hand, has a much softer feel. The buildings are lower. There’s more light. It has it's own unique feel. You teach workshops on iPhoneography (iPhone photography) in various cities. Can you still get good photographic results with an iPhone? Yes, the iPhone is a brilliant tool, and you can do far more with it photographically than many people assume. Perhaps it’s not as high quality as a good camera, but you can print up to A2 and if you learn to use the apps, you can get so much out of the camera. People are often very surprised on workshops at what they can achieve with their photos. Is it possible to still produce soulful photos in cities as you do in natural settings? Cities are amazing places to take pictures. Again, you have to really connect with a city. You have to feel the vibe and really look and see into the spirit of the place. You can get truly contemplative images in cities if you are prepared to wait and watch. Like many photographers, you spend time working at dawn, dusk and all the hours in between, but you also teach astrophotography. Do you enjoy being outside and photographing at night? I’m actually scared of the dark. But I love the fact that, at night, every sense is heightened. Although you might hear and feel more in the day, there is something magical about looking up at the Milky Way and realising just how small we are in all this space and yet how self-absorbed we have become, destroying our environment and each other through greed, yet, to put it simply, how lucky we are to have such a beautiful, wondrous place to live. For details of Paul's photography tours for Light & Land, including Kyrgyzstan, Albania, Paris and New York, head to the Light & Land website. All images: Paul Sanders.